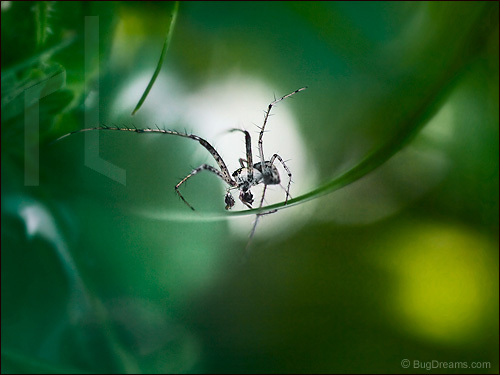 A spider does a little soft shoe, an old-time arachnid vaudeville act on a grass blade stage. Whenever I post a spider image, I get no comments. I just returned from a dust-up on Facebook, advocating not killing spiders and taking some abuse from the spider-haters. Now this post is one of my most commented on! So is anyone brave enough to make a comment? Can a spider get cuter than this? This entry was posted in Insects etc. and tagged arachnid, biodiversity, grass, invertebrate, nature, soft shoe, spider, vaudeville, web, wildlife. I never kill spiders. They eat little bugs, so why bother them? Yea, Spiders!! Right on, Denice. If spiders are in a home, they’re eating bugs you probably don’t want, otherwise they’d die of starvation. I happen to love spiders. They’re fascinating to watch and photograph, and they offer a free service I happen to find agreeable. Thanks Jason. Those long legs are really expressive. I love spiders also! I always shoe them away when I’m sweeping up or cleaning. If people really understood how helpful they are they’d never kill them. It was that darn Brady Bunch episode that made people everywhere afraid….Bravo spiders! You’re right, Megan. Ignorance is always the problem. I have the same concern whenever I post spider images as well. Bravo for a superb photo! Thanks Mindy & John. I hesitate now before I post a spider image, but I’m glad I did. Maybe I need to ask more often about our reactions to these little alien beings. spiders are beautiful … in the garden. proceeded to bite off its legs one by one, then flew with the poor legless thing up to its nest. Thanks Mairi. Wasps can be fierce predators, no compassion among these small creatures. And I believe this spider is a female, I think those are eggs she’s carrying. aaah … I wondered if they were eggs she was carrying! I have watched spiders carrying a whole mass of tiny little spiderlings around on their backs. How can anyone dislike such a good mother, Mairi? Thanks Alex. Always challenging, but worth it. Im longing for a pet tarantula. I’ll name him Harry !!! They’re actually kind of cuddly, Denice. And their bite is no worse than a bee sting. Wow, this is a great image, congrats Rick! Thanks Bogdan. Sorry about the allergy, remember spiders are afraid of us, too. Yeah I know, it’s not their fault, my skin is too sensitive, and you’re most welcome. How can anyone who read “Charlotte’s Web” as a kid hate spiders? Nice to find someone else who enjoys these complex and fascinating creatures! Thanks Max. Charlotte’s Web is a great book. What about other fictional arachnids? Complex and fascinating creatures indeed. Whenever I hear some mother telling her daughter about good bugs and bad bugs, I’ve been known to chime in with a firm rebuttal. They’s all good. And without spiders, I can’t imagine how we’d be over-run with other six-leggers. Everything has a balance in nature. Thanks for posting this lovely image Rick – wonderful work! Good point, Amy. I like them all, and the predators are often the most interesting. We wouldn’t like a world without spiders. Publishing spider pics is a great way to scare people off. I have had the same problem. A beautiful shot of a beautiful fella. I really love it! I doubt this guy has any strong maternal instincts tho. Spiders with their “boxing gloves” on are males. I’m glad it didn’t scare you away, Tom. I’ve gotten more comments than usual. And thanks for confirming that he’s a male. Wow! It actually does look like a vaudeville act. All your bugs have so much character . . . I don’t know how you get them to pose for you! Thanks Zoe. All this spider needs is a top hat, I’ll book her in the Catskills! This is an adult male mimetid, a “pirate spider.” Mimetids are obligate predators of other spiders, although in captivity they will take other prey. What look like eggs are actually the copulatory organs- all spiders transfer sperm indirectly with their palps (or “hands” if you prefer). Great! Thanks for identifying this spider, Steve. I always appreciate any help classifying the behavior or species of these animals. What an amazing balancing act, and another perfect shot He DOES look like he’s posing for you Rick. Siegfried or Roy of the insect world? I’ve always been a “live and let live” kinda girl! I go so far as to release any bugs, spiders or insects back outside (weather permitting). I could never understand those who kill something so much smaller than themselves, and for fun. That’s just too sad, every creature has a purpose and since we as humans tend to destroy ecosystems so rapidly, they have nowhere to go. WE are the intruders . . .
Hopefully I’ll help to show how cool these spiders are. Once you see that, you’ll think differently. I had an Experience with a dying garden spider here in London. Changed me for forever. Still amazes me as I wasn’t looking for anything like what happened. Wish you could photograph the spiders in our park! Thanks for the comment, Karin. I would love to do this around the world. Cultural ambassador through wildlife photography. We had a few jumping spiders that lived in the nooks of our carpeted stairs. We raised our daughter, Olive, to just step around or over them. For years she would say “hellooo spider” every time she went upstairs. It’s one of our best memories. Of course we had no other bugs to really speak of. This is remarkable. Even though I have mild Arachnophobia I do find this spider adorable! I also find the jumping spiders to be quite adorable as well. I saw a video of your a noticed you were using a viewfinder enhancement of some sort. Do you use that for still photography and what advantage does that offer you? Thanks! Thanks Nate. The viewfinder attachment helps me achieve critical focus. Thanks for getting back to me! Have you seen the veravon multifinder? It allows you to turn the viewfinder magnifier into a right angle viewer. Thanks Nate. I use something similar, sometimes with a right angle viewing attachment.